In this series of 24 captivating lectures, an award-winning teacher and acclaimed scholar delves into the story of how, why, where, and when we became human. 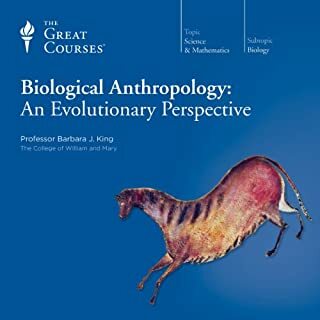 You'll gain a fresh understanding of the forces that have shaped our species, as Professor King synthesizes the best that more than a century of scientific scholarship has to offer across a variety of disciplines to gain the insights offered by fossils, ancient skeletal remains, and lifestyle information like cave art and stone tools. "One reason why the skepticism [of evolution by Creationists] may exist in the United States. Is that there seems to be a feeling that it is necessary to somehow choose between believing in evolution and believing in God. Between evolution and having a religious faith." "Quite often if we read books or articles or tune into talk shows or look at the Internet this situation is presented in this polarized, dichotomized way. You can believe in God or you can believe in evolution, but you've got to choose." "Well, biological anthropologists and other scientists make a different type of statement and have a different type of understanding. What we suggest is that it is quite possible for religious faith and belief in evolution to co-occur, to coexist. Of course, one may choose between them, and certain religions may force a choice. But in many cases, religious faith is compatible with belief in evolution. In other words, I-- myself-- know many individuals who believe in God and believe in evolution at one and the same time." This assertion is simply untrue and only supported with her anecdotal opinion. The Pew Center has studies that show that the majority of general scientists (59%) don't believe in God. This percentage increases dramatically when discussing specific material claims of the large U.S. religions (virgin birth, resurrection, etc.). This percentage also increases dramatically when narrowing the scientists to fields such as anthropology or those closely related to Ms King's. There are no widely practiced religions that have a creation story that can be called compatible with evolution. There are certainly some people who place their God earlier in time than the information we've gathered and find a way to vaguely define their relationship with that God as transiting the material to non-material boundary (that they invent.) But this isn't the typical religious belief system. The contradictions between evolution and faith aren't "presented" in a polarized way. They are by definition diametrically opposed. Every bit of evolutionary theory that is generally accepted among experts is the result of scientific study, and under continuous challenge, revision and refinement. Every bit of popular religious ideology is premised on one book, written decades after the events that it describes and an insistence that "belief without evidence" is sufficient to gird up its obvious subjectivity and inconsistencies. Evolution is based on the concept that simple systems of force and composition can agglomerate to produce new levels of composability. (Because if you believe in evolution, you believe in cells, and if you believe in cells, then you believe in DNA, and if you believe in DNA, then you believe in proteins, and compounds, and molecules, and covalence and atoms and particles.) Religion is based on the concept that the only reason why we exist is because someone (who just happens to be awesome, omnipotent and omnipresent) made little itty bitty versions of himself on one planet, in one solar system, around one of 100 billion stars, within one of 100 billion galaxies. Just the contrast between the quality of thought practiced in science and that which is practiced in religion demonstrates an extraordinary distance between cogency and puerility. No, there's no coexistence between the two belief systems of evidentiary rationalism and fanciful idolatry. Elon Musk, Stephen Hawking, and Bill Gates have proclaimed Artificial Intelligence as a possible threat in the future unless humans learn to use it wisely. Could this be true? Is it possible for us to create artificial intelligence programming so that we'll soon have thinking and feeling AI? Is it even possible for us to have a human-looking AI run for president in the future? All of these questions and thoughts are addressed in Artificial Intelligence: Understanding A.I. and the Implications of Machine Learning. 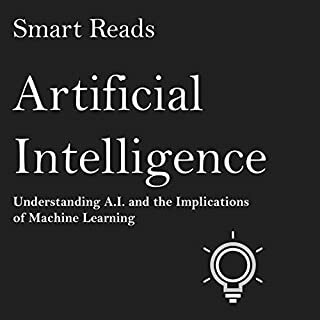 While this book covers a number of useful topics for people unfamiliar with AI, there are frequent statements that make little sense or are either uninformed or stated without reference or citation. Most are opinion statements without qualifying them as such. It will state that 'most people...' or 'workers in the AI industry...' or say something like 'Computers don't think...' It reads like an undergrad who did a modest amount of research for their first attempt at writing a research paper on the topic. Though not awful, this book is decidedly not a smart read. There is no single definition of artificial intelligence (AI), but several. The ultimate goal of the research on this topic is to develop a machine that can simulate some human skills and to replace them with some activities. 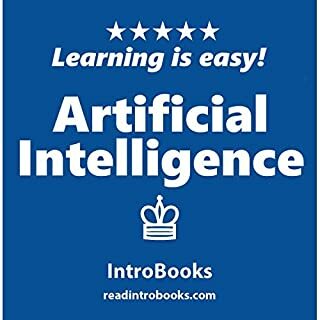 Listen to this book to know more about Artificial Intelligence. This book is difficult to follow because it is written in a style that doesn't translate well to narration. The narrator mispronounces numerous terms and doesn't indicate when they are reading a section title or a caption or general copy. The writing style changes from casual to formal, back and forth. The narrator refers to people by name in a way that makes it hard to understand if they are talking about a historic person or a made up character being used to demonstrate a concept. Perhaps the author doesn't speak and write English fluently, as grammar and sentence structure are stilted, tense is frequently incorrect and quantity terms are oddly spoken in singular or plural tenses inconsistently. The coverage of the topic is also cursory and definitely written by someone without depth of knowledge in the topic. It reads at about an 8th grade level of subject expertise-- incomplete and inconsistent. This is truly an annoyingly poor quality production to try to get through.